Check here regularly for news and events planned for the next several months. Last month's weather brought us a very beautiful "Winter Wonderland" and some epic "Powder Days" up in Tahoe, but it also brought us vineyard delays. Our pruning efforts are getting off to a later start than usual thus pushing back "bud break". "Bud break" is when the new buds form on the vines. We anticipate that "bud break" will happen within the next month for the early varietals such as Viognier and Grenache. These new buds will grow and ripen into what will become the 2019 vintage! This month we have tirelessly been working on fine-tuning and perfecting our 2018 blends. 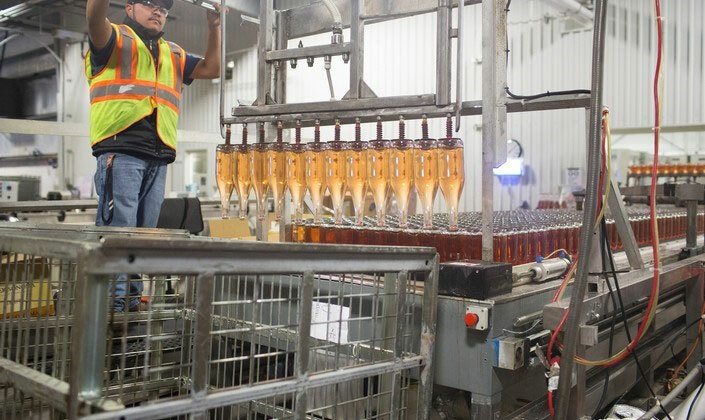 The completed blends for the 2018 white and Rosé wines will be bottled in April. Once these wines have had time to rest in the bottle and are tasting perfectly, we will announce their official release via social media as well as email. All new releases will be available for purchase online and of course, in our tasting room once it opens mid-May/June. We are beyond excited to be sharing these new wines with you soon - especially the Rosé! It is truly a summertime stunner! The clock is ticking with projects to complete before our opening in mid-May/June. Our hardworking crews have diligently been focused on the tasks at hand and each day we get closer and closer to opening! 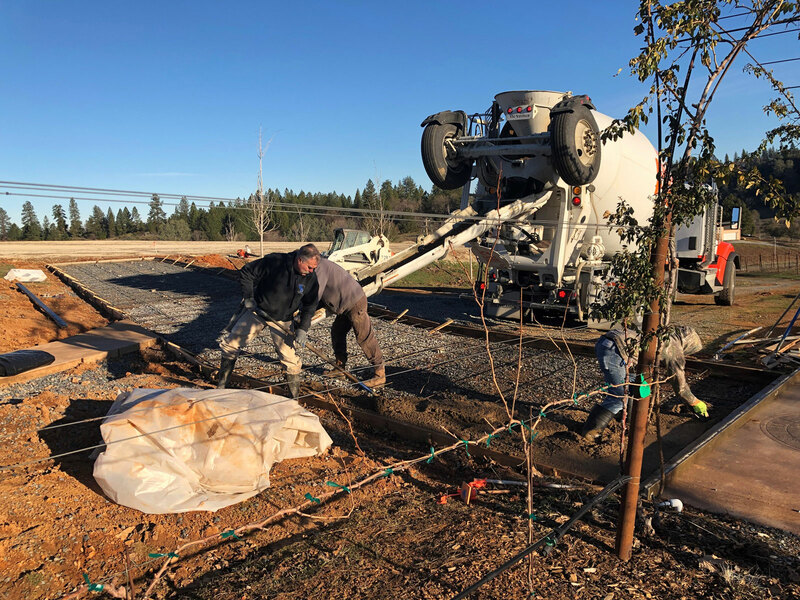 Pictured above, we are completing a section of the Rose Arbor pathway that will link the Tasting Room Patio and parking area to the Amphitheater and Lake Pavilion. Just imagine as you meander down the path through the Rose Arbor, you are flanked on each side with the lush beauty of the vines while soaking in a shady canopy of fragrant flowers! Additionally, construction on our Tasting Room, Tasting Room Patio and commercial kitchen have begun! It won't be too much longer now until our guests and club members are able to enjoy a flight at our Tasting Bar or indulge in a cheese plate and bottle on the patio! Here at Starfield, not only are we passionate and dedicated to the art of winemaking and growing the best grapes possible, we are equally committed to sharing this spectacular piece of land with our guests and club members. To understand Sierra Foothills wine, we believe it's important for guests to get out and experience the Foothills, to become personally acquainted with the terroir of Starfield. Our nature trails are a phenomenal way for you to enjoy the terroir and explore the diversity of our Estate Vineyards while savoring the gorgeous blooms each season has to offer. We have curated and planned so that our landscape has an array of blooms 10 months out of the year for you to enjoy! 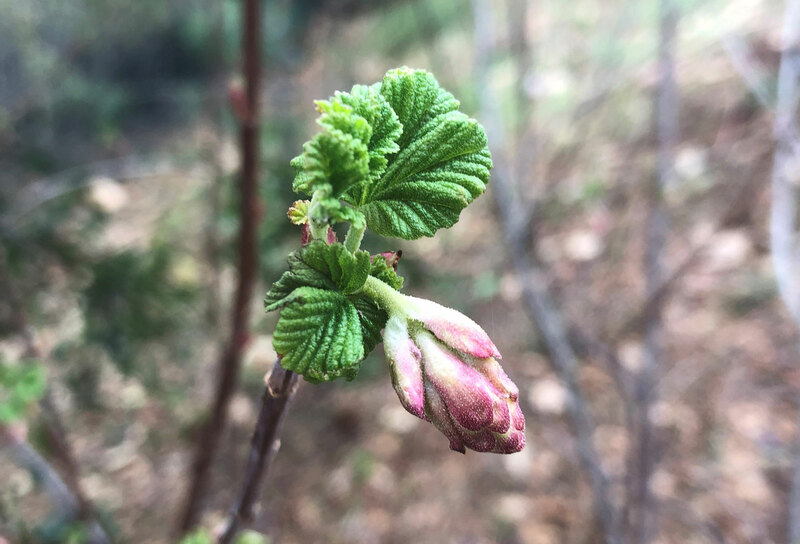 This Pink Flowering Currant greeted us the other day as we enjoyed our walk around Starfield lake. Below is some quick info as to what to expect on these beautiful trails! Did we mention we cannot wait to share this with you all?! Starfield's trail network is over 2 miles long as it weaves through the vineyards, gardens, forest, and ponds. The shortest single loop is a quarter of a mile. Well-behaved, leashed dogs are welcome to join our guests and members on the trails! Plus an abundance of California Poppies, Native Wildflowers, Hydrangeas, Azaleas, Camellias, and many, many other plants! We sincerely thank you for your support of our winery. Should you have any questions or inquiries, please do not hesitate to email Jennifer, our Director of Hospitality and DTC Operations, at jennifer@starfieldvineyards.com. We look forward to hosting you soon!